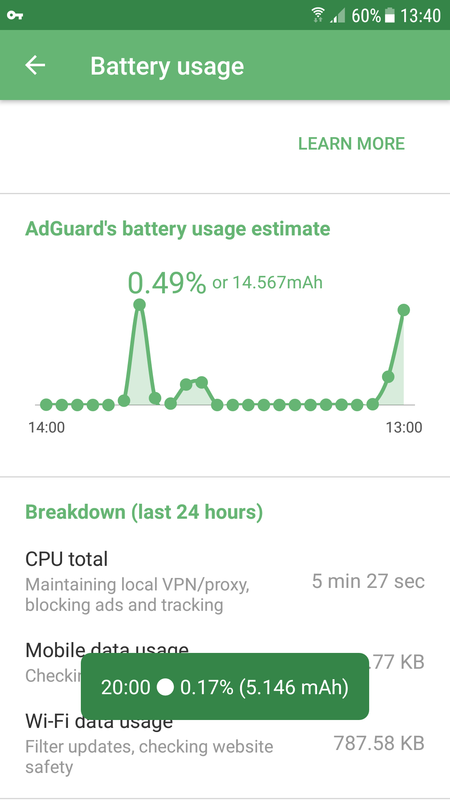 Sometimes you may notice that, according to Android built-in statistics, AdGuard consumes a lot of traffic and/or battery resource. Both these problems are two sides of the same coin. Since in the process of filtering all the mobile traffic goes through AdGuard, Android decides that it is AdGuard that consumes it all. In reality, of course, it is not true. Battery and traffic consumption shown in devices statistics do not represent the facts. The thing is, Android attributes all of the WiFi and Mobile traffic to AdGuard, which was in fact consumed by other apps. Due to this, AdGuards real share of total consumed traffic and battery resource increases, and the share of other apps, on the contrary, decreases. To mitigate this misconception, we added a new screen called 'Battery usage'. You can access it by tapping on the battery icon in the top right corner of the main screen. AdGuard, as expected, is at the top of the chart. 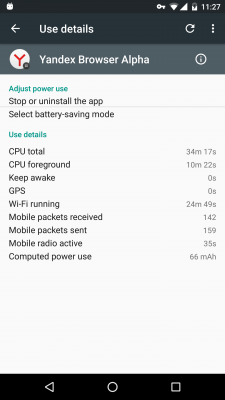 This is generally typical for smartphones (and not at all for tablets without 4G, since WiFi is much less 'costly' in terms of battery consumption). Pay attention to the number of sent Mobile and WiFi packages, which were attributed to AdGuard (Mobile packets sent и Wi-Fi packets sent) on screenshot #2. On screenshot #3 are stats for one of the real traffic consumers, Yandex.Browser. It was not attributed almost any traffic at all, while in reality 70% of the total traffic was consumed by it. 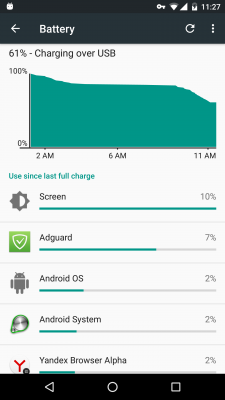 How much battery resourse does AdGuard really consume? First, let us lay down a little bit of theory and links with necessary data. wifi.active= 31mA additional consumption in mAh caused by WiFi data exchange. radio.active= 100-300mA additional consumption in mAh caused by data exchange over Mobile network. cpu.active= 100-200mA additional consumption in mAh caused by CPU work. 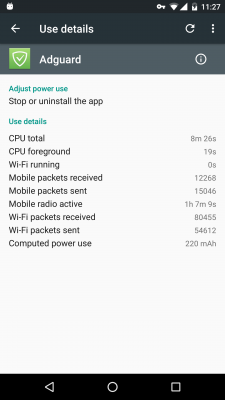 AdGuard by itself almost doesn't consume any traffic, so for the sake of evaluating battery resourse consumption let's get rid of 'Mobile/WiFi packets' and stcik to 'CPU'. Let's put real numbers into this formula. Real consumption is several times less than it is shown in Android statistics. Instead of 220mAh it should be somewhere around 31-40mAh. On the other hand, browser's consumption should be not 66mAh, but ~200mAh.